Being interested in photography since her childhood, Tina Bagué decided to study photography in Barcelona, in the Institut d’Estudis Fotogràfics de Catalunya (IEFC). In 1994, she moved to the United States and studied photography in The University of the Arts in Philadelphia. While she was in the States, she started to document the New York's street life with her Lubitel (a medium format plastic camera made in Russia). This work was later exhibited in Barcelona (Sala Vinçon). After her return to Barcelona, she went back to study photography in l’Escola de Fotografia de la Fundació Politècnica de Catalunya (now CITM). 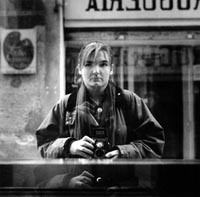 In 1998 she started to work as a freelance photographer. At the same time, she started teaching black and white darkroom work in a photography school (Escola Groc, Barcelona). Getting inspired by the japanse culture and her first trip to Japan in 2002, she decided to specialise in travel photography. From 2003, she exclusively works in color and with digital cameras. She has travelled to more than 20 countries, producing travel reportages that have appeared in many Spanish magazines such as El Dominical del Periodico, Mujer 21, Woman, Viajar, Ronda Iberia, Iberia Excelente, El País Semanal, Rutas del Mundo, Islas, Yo Dona, Conde Nast Traveller, Spanair and in Italian magazines such as Panorama and Panorama Travel. Upon 2002, she started working as the editor of a Spanish photo magazine, Digitalfoto, published in Barcelona by MC Ediciones. Exhibition of her work produced in Japan will be held in Barcelona in March 2009.